1. What were the main reasons you became a member of the community garden? 2. What do you like most about the community garden? Meeting friendly new people to share ideas with in an open and peaceful environment. Growing a choice of various organic fruits and vegetables in an urban environment. 3. What doesn’t work and how could it be improved? Lack of community participation with communal garden spaces and attendance to meetings. 4. How often would you like to see garden meetings held? 5. How should we rank our priorities for next year? 6. What kind of workshop tickles your fancy? more involved in the garden? Being able to know how to participate, contribute, and help more around the garden. Having access to soil, mulch and compost that could improve the garden beds. Being able to dedicate more time to work on plots and garden. 8. Do you have a particular skill the Maroochy Neighbourhood Centre could utilise and are willing to use? 9. If the Community Garden was a person how would you describe its personality? Do you have a balcony, verandah or windowsill that you’d like to grow an edible garden or a community garden plot where you want to maximise the yields in a compact space? Or are you renting and need ideas on temporary, mini portable gardens that you can take with you? Or maybe you are a beginner gardener or family with children wanting to start small with some simple easy solutions? Presented by Anne Gibson Founder/Publisher of Green Journey and The Micro Gardener(www.themicrogardener.com) Anne will show you how easy it is to make your own potting mix, plant up a salad garden in a repurposed container, plant for year round abundance and through clever design, have colour, beauty and fragrance in your edible garden. 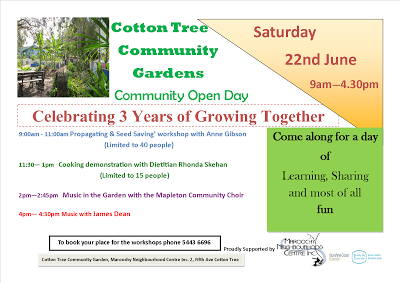 Weather dependent, the workshop will include a tour of the community garden plots. 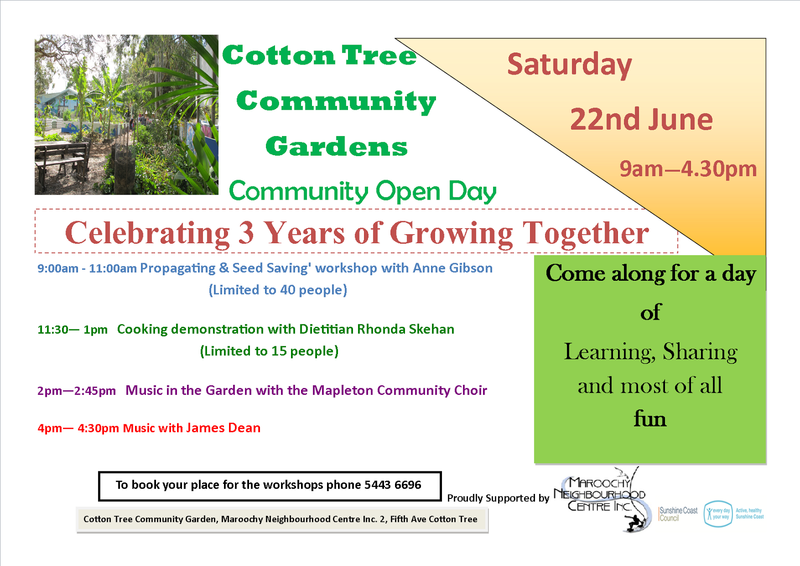 Venue: Cotton Tree Community Garden, Maroochy Neighbourhood Centre, 2 Fifth Avenue, Cotton Tree. Bookings Required. RSVP to Maroochy Neighbourhood Centre Ph. : 5443 6696 to register your interest. Limit 40 people. This Sunday 24th June we are celebrating our second birthday. We will celebrate the occasion with pizza in the garden at 12 Noon. The 2012 Community Garden Annual General Meeting was held on Wednesday 16th May at 6pm. We had some changes to the committee and wish to thank the outgoing committee members for all their hard work in doing the administration of the Garden, over the past year and more. It's great to have a new committee coming in, and they are ready for their new roles. We are pleased to have Caroline continuing in the role as secretary. General Committee Members: Elizabeth Anthony, Denise Melloncelli, Sheena Gilmour. Wildlife- Planting locally native vegetation to encourage, protect and feed local fauna. Get up close and personal with Geckoes' collection of furry and feathered friends. Learn about locally native Sunshine Coast animals that you might find in your own backyard; as well as listening to advice on planting locally native vegetation and creating habitat to encourage, protect and feed local fauna. No booking requiredBring the kids! *Potted Plants * Books * Craft Items and Cake/Sweets will be available for sale. The teacher noticed that one student had not finished her paper. So the teacher asked if she was having trouble with her list.The girl replied, “Yes, a little, I couldn’t quite make up my mind because there are so many.” The teacher said, “Well, tell us what you have and maybe we can help”. The things we overlook and take for granted are truly wondrous! Perhaps a reminder to us all, that the most precious things in life, cannot be built by hand, or bought by man. Sunday 22nd March. 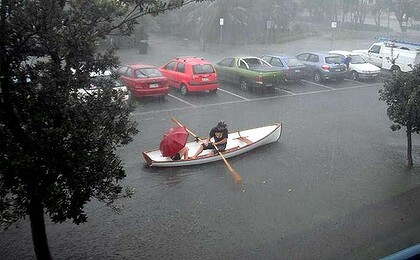 Please bring a hat, water and gloves. March saw just under 400mm of rain fall around Cotton Tree with the community garden and local streets covered with water. Thankfully the garden come out pretty much unscathed with only the banana circle being its only victim. While I'm on about the bananas, they have produced their first crop with all five trees producing one bunch of bananas. I for one am looking forward to tasting these little morsels.